Chuck Stranahan is known among his professional peers as one of the most talented fly tyers of this era – a recognition the angling public is now coming to share. A long-time professional fly tyer and guide, he is also a writer, instructor, and speaker at fly-fishing clubs and sportsmen’s shows. He began fly tying at eight, and was tying flies commercially at age twelve. He fly-tied his way through college as an Orvis commercial fly tyer and through a ten-year career in education, before opening a full-time fly shop in 1979. He learned the fly tying craft from masters such as Cal Bird, Polly Rosborough, Darwin Atkins, and Andre Puyans. His style blends their techniques with his own innovations. His fly patterns are becoming standards throughout the West, and are featured in books by Jack Dennis, Gary LaFontaine, Greg Thomas, John Holt, and Randall Kaufmann. He learned flycasting and fly rod design and manufacture from some of the masters who shaped the sport, beginning as a college student in San Francisco on the Golden Gate Angling and Casting Club ponds. Over the years he fished with many of these same mentors, honing his own skills as an angler. He is a program regular at regional and national Fly Fishing Federation Conclaves. He has been active in FFF activities since the late ‘70’s, and has been recognized for his conservation efforts as a recipient of California Trout’s Streamkeeper award. His flies, noted for their aesthetic qualities and durability, have gained a loyal following because they out-produce more widely known patterns. Until recently, most of them were available only to the “underground army” that Chuck tied for personally. Fortunately, many of Chuck’s patterns are now available to a much wider audience. They are now distributed nationally to fly shops through Doug’s Bugs/Frontier Flies, where Chuck is a marketing consultant and fly designer. He lives with his wife Jan in the Bitterroot Valley of Montana, where he runs Chuck Stranahan’s Flies & Guides. COMING SOON: The Trout Seminars will offer fly shops the opportunity to choose from a wide variety of Chuck’s offerings to produce individually planned full day programs. Ideal for special events and seasonal promotional activities. Please inquire. Casting Clinics, Fly Tying Demonstrations and Clinics, with emphasis on trout flies and fishing, can be arranged to suit any group’s needs. Chuck’s typical evening program includes a fly tying session during the social hour, and a full-length slide presentation (PowerPoint available fall ’05) in the evening. Raffle items from sponsoring companies and auction items help clubs defray expenses. If you are interested in having Chuck speak to your group, or arranging on-site instruction, please indicate the date(s) and type of program preferred via email. 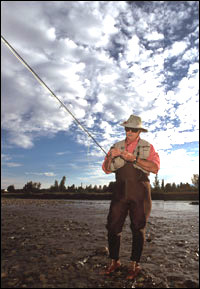 Chuck has been seen on television’s Fly Fish America Television Magazine, and the PBS News Hour. His flies are featured in books by Jack Dennis, Greg Thomas, Randall Kaufmann, and John Holt. His writing has been published nationally in several books, on the Fly Fishing Connection and FFM Virtual Flyshop websites, in Fly Fisherman and the FFF’s Flyfisher magazines.